The earliest history of Crimson athletics appeared in The Harvard Book, a compendium published in 1875. Rowing and baseball were then the only established intercollegiate sports; football and track were still in their infancy. Almost 50 years later, in 1923, the Harvard Varsity Club brought out The H Book of Harvard Athletics: 1852-1922. Its 624 pages were devoted to just five intercollegiate sports: rowing, baseball, football, track, and ice hockey. A Second H Book followed in 1964. It covered 15 major and six minor sports, and ran to 960 pages. Now comes The Third H Book of Harvard Athletics: 1963-2012, published by the Varsity Club in November. Its two volumes chronicle an eventful era that saw the rise of women’s teams and the addition of fencing, golf, sailing, skiing, volleyball, and water polo as major sports. Those developments upped the number of varsity squads to 41—the most of any college in the country—and spurred a multimillion-dollar expansion of the University’s physical plant. HB3’s 1,368 pages hold some 410, 500 words of text, double the wordage of the 1964 book, and nearly 1,000 illustrations. An introduction by John Powers ’70, a veteran Boston Globe reporter, surveys the transformative changes in the athletics landscape since the 1960s, and tracks Harvard’s ascent to the top of the Ivy League heap in many of the two dozen sports in which varsity teams now compete. The book also features the first inclusive history of the 104-year-old Varsity Club, prepared by Craig Lambert ’69, Ph.D. ’78, a former editor at this magazine. A final section lists the 11,400 athletes who won major Hs (for extended participation in a major varsity sport) from 1963 to 2013. From initial prospectus to final press run, HB3 was nine years in the making. Most of the chapters were produced by the book’s two principal writers: John Veneziano, Harvard’s sports information director from 1989 to 2002, and Powers. The general editor was John T. Bethell ’54, who edited Harvard Magazine for 28 years and wrote its football columns for four decades. Daniel J. McCarron, former associate University publisher and University printer, served as art director and production manager. 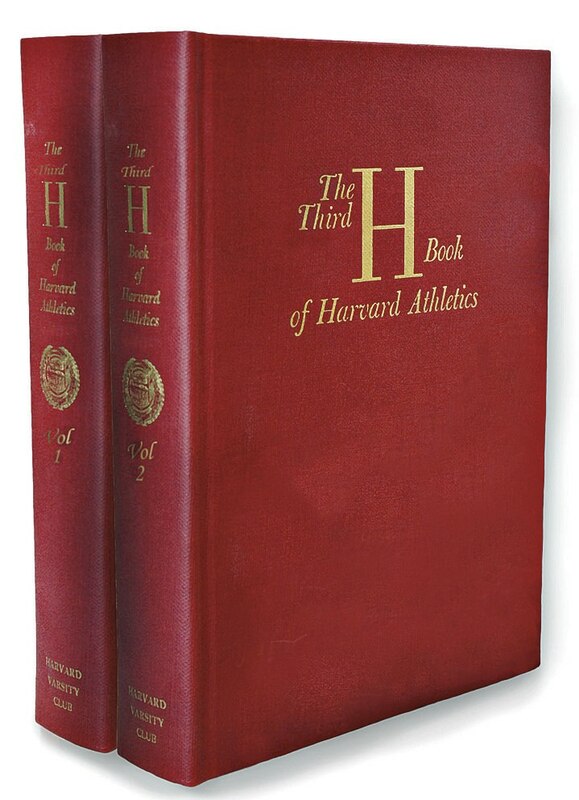 Priced at $75 ($65 for active members of the Varsity Club), The Third H Book may be ordered online from the Club website (www.harvardvarsityclub.org). Its two volumes are also available in boxed sets that include the first and second H Books.